Papa John's Pizza franchise business opportunity. Free Papa John's Pizza business franchise information. Papa John's International, Inc. is the third largest pizza company in the world, based on system-wide sales, with approximately 3,000 restaurants worldwide. At Papa John's, we pride ourselves on quality and the simplicity and efficiency of our operating system. Papa John's strives to constantly improve the support we provide to our franchise family. 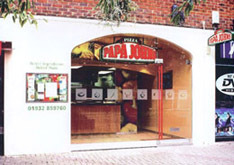 Papa John's assists franchisees with site selection and equipment packages in addition to providing training assistance, restaurant-level marketing guidance, and general business consulting. Restaurant Openings - Our Real Estate team offers aid and guidance in determining the ideal site for each restaurant, and we also provide customized assistance to our franchise community for restaurant openings. Training - Papa John's assists franchisees by providing a comprehensive academic and “Hands-On” training program. We also assist with new product and equipment deployments as well as the development of trainers and training systems. Support Services - Papa John's commitment to quality extends well beyond the "better ingredients" that make our "better pizza." To ensure superiority in every aspect of our business, Papa John's Support Services team offers print and promotional items as well as uniforms and training materials to franchisees. At Papa John's, our passion to be the best has driven our amazing growth to approximately 3,000 restaurants worldwide and a sixth straight number one ranking in the American Customer Satisfaction Index (as published in the Wall Street Journal). Papa John's is currently seeking experienced franchisees for multi-unit restaurant development in areas throughout the U.S and many international markets. To learn more about the Papa John's Pizza franchise opportunity, simply complete the form below.